Universal coal listed on the ASX in 2010 on a portfolio of near-term exploration projects. The Universal team had a clear strategy in mind how the company would progress from a junior explorer into an established South Africa coal miner. Universal Coal quickly went about commencing construction on the Kangala mine which reached production in 2014. Following that the company needed a second mine, the New Clydesdale Colliery (NCC), to reduce its exposure to the somewhat volatile coal market and now it is evaluating how to progress with a third project once NCC comes online. One of the best indicators of the success Universal Coal is having is it being subject to three takeover approaches within the last year. The market recognises the speed, efficiency and productivity of the company and its projects, and each approach has been at significant premiums to Universal’s recent share price. The Universal Coal story starts with the Kangala mine. The 70%-owned project has a 146.1 million tonne (mt) 2012 JORC compliant resource, located in the Witbank coalfield 65km east of Johannesburg. The project required a relatively low capital outlay at AUS$47 million and has a low life-of-mine operating cost at $15 per tonne. 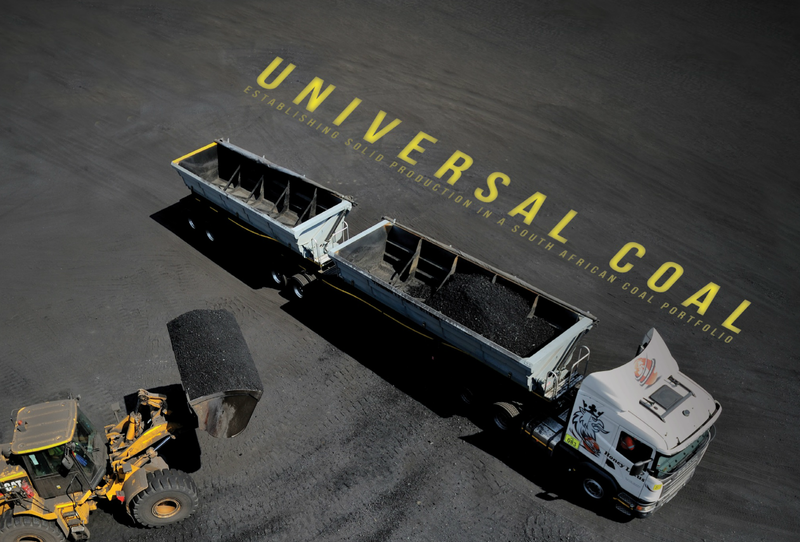 Universal Coal has shown itself to be a shrewd operator in the market when it signed an eight-year coal supply agreement with Eskom in March 2013 with an option to renew for another eight years – the mine is protected from international coal prices thanks to the fixed price contract. Weber explains the initial discussion with Eskom was to supply 2 million tonnes per annum (mtpa) but that has since risen to 2.4mtpa. Establishing production at Kangala represented a major operational achievement for the company, according to Weber. Kangala entering production coincided with a depressed global coal market. Since then, while production has remained stable, although Universal Coal has had to reconfigure the open pit operation due to slope stability. However, the pit reconfiguration led to Universal reaching record production last quarter in terms of tonnes. This wasn’t reflected when it came to cash flow but Weber explains that is because the mine still had high stripping ratios and there was a lot of waste. He is very positive about the near future for Kangala. The NCC is a multi-product coal project located 35 km south of Witbank. It has a 2012 JORC compliant coal resource at 165.4mt including a 3.2mt plant acquired from Exxaro. In contrast to Kangala, Universal developed the underground mine at the NCC as the first phase and is now focused on developing the open pit second phase which will significantly progress the project. The underground mine is not yet in a steady state but is in the process of ramping up. Weber expects that, once complete, steady state production will be 900,000tpa. However, it is the open pit operations at NCC that will provide the significant boost to production and an extra layer of revenue and protection in the coal market. The second leg will add almost 2mtpa of run-of-mine coal and will supply additional product streams in metallurgical and thermal coal. Weber stresses that once the offtake agreement is formalised NCC has a swift ramp up period and will be in steady state production within six months. Universal Coal, under Weber’s direction, had demonstrated its capabilities by bringing two mines into production in a relatively small time period. Bearing in mind all the approvals and studies involved, that is no small feat. “You have to set yourself goals. It is one mine at a time and coal is one of those bulk commodities where it doesn’t help having anything in the ground, you have to bring it out to realise value. We’ve always said our intention is to become a multi-mine owner and the first step was to get the first operation under our belt then move onto the second. However, Weber is quick to point out that he is not just looking at growth for the sake of growth. He is specifically targeting growth that adds value to the company and will end up realising shareholder returns. While the principal focus of the company in the near term is to get NCC up to steady state production, Weber is serious about expanding Universal’s project portfolio on a value-add basis. All the licences are currently in place for a development at Brakfontein although it will only be progressed once the studies are completed to ensure it will add value to the underlying company. Universal Coal are operating on a contract mining basis for both projects. At Kangala, Stefanutti Stocks is in place as the contract miner with MRD Engineering working on the plant side. At NCC Ingwenya is upgrading and operating the plant and STA is doing the underground mining. Weber explains that in this model having the right contractors is critical to the operation. So with Kangala reaching a steady state of production and a firm focus on bringing NCC up to the required level – with the development of the open pit mine – Universal Coal is in a healthy position to grow in the coming years and realise shareholder value. If Weber can add a third operation to the portfolio Universal’s position in the South African coal industry will only be strengthened.